Destroyit Paper Shredder Model 4002 - Technology Unlimited, Inc.Technology Unlimited, Inc. The Destroyit 4002 Paper Shredder is a heavy duty, high volume shredder specially designed to shred large quantities of material daily. The custom “Easy Switch” control element uses color codes and back-lit symbols to indicate operational status. There is an auto-stop feature that notifies when your shred bag is full or when the cabinet door is opened. This feature will trigger the shredder to stop automatically. It has an automatic reverse and will stop in case of paper jam and also has double protection against overheating, automatic start and stop controlled by a photo cell. Equipped with a 16 inch feed opening and it shreds with the speed of 25 feet per minute. 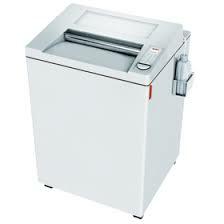 This shredder is ideal for shredding: staples, paper clips, credit cards and CD’s.